Gathering together for worship is an indispensable part of your family’s spiritual life. It is a means for God to reveal himself to you and your loved ones in a powerful way. 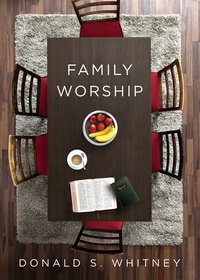 This practical guide by Donald S. Whitney will prove invaluable to families—with or without children in the home—as they practice God-glorifying, Christ-exalting worship through Bible reading, prayer, and singing. Includes a discussion guide in the back for small groups.